Those lucky enough to get anything will be getting a zine too. Kanye West's Calabasas collection came and went very quickly on Tuesday. On Monday, Surface Magazine announced that Kanye x Adidas would be going on sale, and by Tuesday afternoon the collection was entirely sold out. 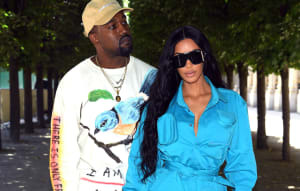 The collection included crewneck sweatshirts with "Calabasas" running down the sleeves, track pants, socks, a baseball cap, and the Yeezy Powerphases, the sneakers that have been anticipated ever since they were shown at West's Yeezy Season 5 show last month. You can see the full collection at YeezySupply.com. Fans who were lucky enough to cop anything from the line will be receiving a Calabasas zine, which was art directed Cali Thornhill DeWitt, styled by A$AP Nast, and shot by Dan Regan. The zine features the model Ganna Bogdan, who posted several pictures from the shoot on her Instagram.